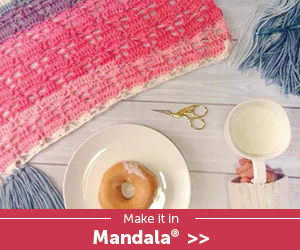 Have you tried this new Mandala© Yarn* from Lion Brand yet? This yarn has several colors on one huge ball and is great for a striping or multi-color effect without having to change skeins. It’s soft and easy to work with. I love the look and its fun to use. Oh, and the best part is, at 590 yards a ball, it’s enough yarn to make one project or even two! My only problem was finding different projects that would highlight the yarn’s beautiful color transitions. My favorite pattern by far to use with the Mandala© Yarn is the infinity scarf pattern using the v-stitch by FiberFluxBlog.com. On her blog, Jennifer, shows this pattern using a bulkier yarn but using the Mandala© Yarn, a much thinner yarn, gives the v-stitch a gorgeous lace effect. I used Mandala in Valkyrie. This scarf looks so summery. I call it my Shades of Sherbet scarf. I did modify the pattern slightly by using a base row of 22 instead of 19. You just want to keep your foundation row in multiples of 3 plus 4 and you should be fine. Then you can stitch as many rows as you want. This pattern is easy because it’s just repeating the same stitch the whole time. Perfect for crocheting while watching TV. My scarf is just over 60 inches from row 1 to the end. I also manipulated the colors a bit by removing a few and not using the full amount of certain colors (starting a new color early) because some had way more yarn than others and I wanted it to be somewhat consistent. I used a single stitch to connect the two ends together. This scarf is also for sale here. This yarn is sometimes available at your favorite craft store on sale, but they don’t always have all of the colors. For instance, I was looking for Mandala© Baby in Wishing Well, for my next project and it was not available at my favorite craft store. To check out all of the different available colors of Mandala© Yarn by Lion Brand, click here.